Does a breach of contract issue have you worried? If circumstances are forcing you to breach a contract instead of fulfilling your obligations, or if someone you have contracted with isn’t living up to their responsibilities, it is time to contact a contract attorney. The penalties for failing to fulfill your duties under a contract can be a significant financial burden, and the costs of dealing with another party’s failure to deliver under a contract can also be a major legal and financial hassle. A contract lawyer can help you minimize your financial penalties if you are considering a breach of contract, and they also can provide you with sound strategies and legal recourse if you are the injured party. If you need to breach a contract, do you really need a contract attorney? If you are the party breaching the contract, there is always a slight possibility that the other party won’t take legal action against you, but really, the chances are slim. Before you end up in court over a breach of contract, you should meet with a contract lawyer to find out how you can best defend your position. Under certain conditions a breach of contract may be warranted, but it really depends on what kind of contract it is, how well it was written and the performance or actions of the other party. Based on the advice of friends or family, a lot of people believe that they can get away with a breach of contract, but even if you feel your position is justified, you may still be liable to the other party. It may be a big mistake to breach a contract without the prior advice of a contract attorney. If you breach a contract, does that mean that you have to go court? If you decide to breach a contract, whether or not you go to court depends on the other party. Occasionally, the other party won’t pursue a breach of contract; however, the option to take you to court is totally up to them. If you consult with a lawyer before you breach a contract, you will be well informed about the consequences if the other party chooses to pursue you for the breach of contract. How do you know if you need a lawyer when the other party breaches your contract? If you feel that the other party to your contract has failed to perform, there are a few questions you should ask yourself before you decide to hire a contract lawyer. Usually, a contract attorney will offer a free consultation in which you can get some of these questions answered. Most attorneys will let you know up front if they don’t think it would be a worth taking your breach of contract case to court. What if a contract lawyer declines to take the case? From time to time this happens. It may be because you don’t have a solid enough case against the party, or the attorney may have a conflict of interest that prevents them from taking the case. Find out specifically why they refused your case. 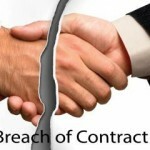 Does the person responsible for a contract breach pay the attorney fees? Usually, if you win the case, the party that breached the contract will be ordered to pay the attorney and court fees, unless the terms of the contract provide otherwise. However, you must be willing to pay the fees in case you fail to win your breach of contract case. How can you protect yourself against a breach of contract? If you are considering entering into any significant contract, it is best to consult with a contract lawyer and have the contract prepared with your legal interests in mind. Verbal contracts are difficult to enforce, and “do-it-yourself” contracts, even when in writing, often do not provide all the protection you need. When you have a legal expert prepare or review your contract, you will know that your rights are being protected and explained to you, and you will know what to expect if a breach of contract occurs.